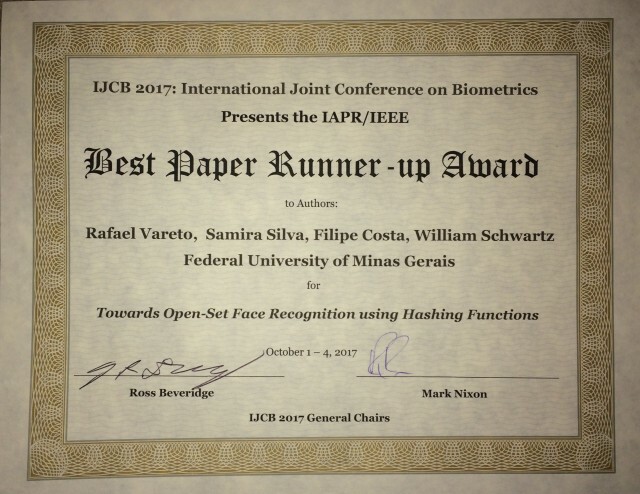 SSIG paper Towards Open-Set Face Recognition using Hashing Functions received the Best Paper Runner-up Award in the International Joint Conference on Biometrics (IJCB 2017). This paper tackles open-set face identification. The problem of open-set face recognition determines whether the subject’s picture presented to the recognition system belongs to a known individual (person in the gallery). This problem is of great importance to find suspects in public environment. Open-set face recognition has a large room for improvement since only few researchers have focused on that subject. In fact, a real-world recognition system has to cope with several unseen individuals at real time and determine whether a given face image is associated with a subject registered in a gallery of known individuals. In this work, we combine hashing functions and classification methods to find out when probe samples are known [more information]. Rafael Vareto, Samira Silva, Filipe Costa, William Robson Schwartz (2017): Towards Open-Set Face Recognition using Hashing Functions. In: International Joint Conference on Biometrics (IJCB), pp. 1-8, 2017.